Of the many vexations with Linden Lab, no other exceeds my anger at their inability to understand how the US academic calendar works. In October 2010, they threw us all for a loop when they decided to jack up tier for educators in the midst of our fiscal year. At the time, educators reacted with confusion, shock, and finally, justifiable anger. Since then, even SL stalwarts have noted the decline in educators using Second Life with their classes, as evidenced by the dwindling of college & university sims, posts to the SLED list, and lower participation in meetings such as our VWER group. Now, with the mix of classes I teach, as well as research interests, shifting, I prepare for what is likely my last-ever use of a virtual world in the classroom. I've planned a suitable finale at the Virtual House of Usher, but then I read the Firestorm Viewer blog, noting an easily overlooked Linden Lab announcement from June 2012 about "Project Shining." On the surface, the switch to "server-side baking" will reduce one of SL's vexing problems of avatars not rendering properly. That's of interest to every category of user. For the technical details well explained, I point readers to Inara Pey's post on this topic. Yet once again, the Lab prepares a massive change to its viewer software without considering what educational institutions might do mid-term in a semester. Project Shining will apparently roll out this month, just in time for my students' final examinations involving Usher. For some schools, it will mean more and finding a Plan B viewer that works on a few computers: lab software often gets changed over summer and winter breaks. This is one reason my school, even during SL's honeymoon era when our IT staff had avatars, never installed any viewer on our lab images. Now these folks, like many IT staff nationally, have forgotten their SL flirtations and have focused on the new (and more promising) shiny object, mobile devices. No way I could get an SL-based project on their radar. Yet thanks to the good will of Evelyn McElhinney of Glasgow Caledonian University, Usher returned to Second Life, with the structure of the House built at Jokaydia Grid and many props added from SL builders such as Morris Mertel and Trident. I've been shopping for a combat system too, all of which would support the hard-working, long-suffering content creators of the virtual world. They are probably the only group to suffer more than educators from Linden changes. Every time a server-code update breaks a script, it means more work for them. 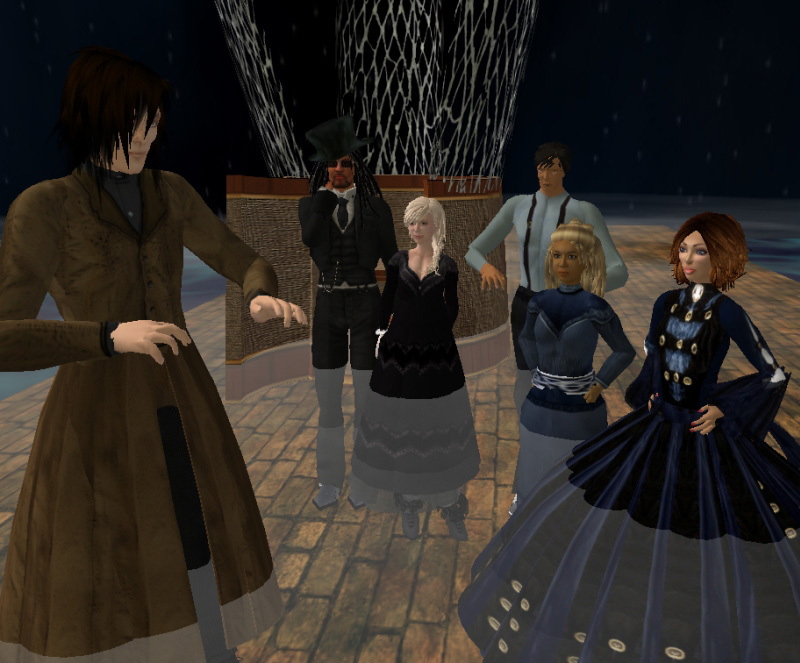 The last time Usher ran for my class, I used my Jokaydia Grid's build, soon to be packed up as a final OAR as I end my work in OpenSim as well. Jokay's grid has moved to OSgrid and I've not yet logged on to check if my Plan B works. Expect an update here, and soon. Thus I'm not sure we'll use Second Life for the exam. Expect an update on my decision after Jessica Lyon of Firestorm meets with VWER members later today, to talk about what her team is doing to be ready for the big update.